When we were growing up mom would buy a pumpkin every year for me. I knew that when my pumpkin was done being cute and part of the Halloween scene it would get cooked into something special. Of course the usual was a pie. Here is what she did with the puree, well one of the the things. These are not too sweet, just right! These are so easy! If you are looking for a white chocolate fall spice bar with pumpkin in it, you just hit the jackpot of all bars. 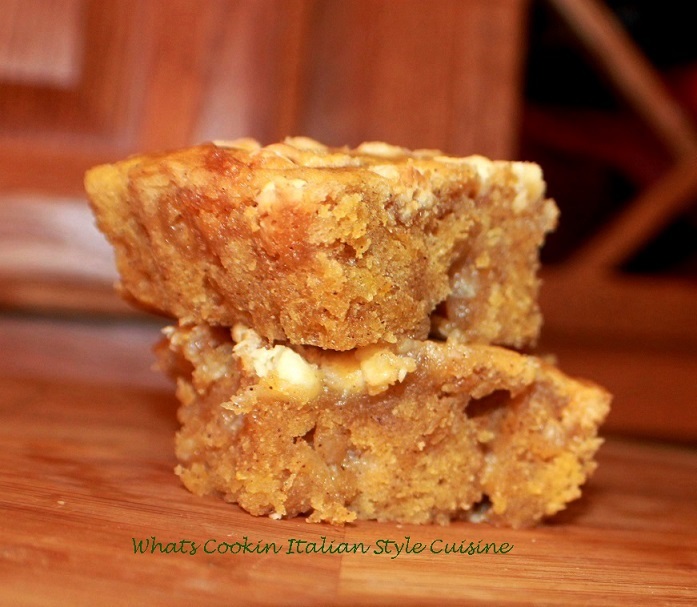 These are similar to blondies, but better rich with pumpkin and white chocolate. These delicious bars are full of buttery rich flavor and perfect for the white chocolate lover. The bars are moist and the best part? They're made from scratch, no preservatives and easy! Fall makes me think of cinnamon, spice, pumpkin and the weather has a chill in the air. The aroma of these baking gives everyone a sense of comfort and warmth. I have made these every year and these are the most asked for bar for any event, gathering or fall family game day. These bar are so easy to make from scratch you won't believe it. 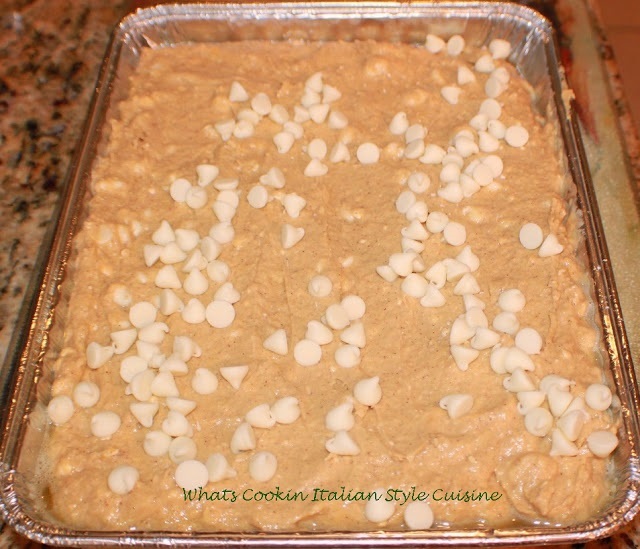 A great white chocolate pumpkin bar that also freezes well, if you want to add them to a Christmas cookie tray. These also travel well packed in containers with wax paper in between each bar so they don't stick together. I always use a plastic disposable knife to cut them with, they won't stick and make perfect cuts! If you love homemade from scratch baking, keep this recipe handy. You will be addicted to great taste, aroma while baking these homemade white chocolate pumpkin bars. They are also perfect for making around Halloween and Thanksgiving Holidays. 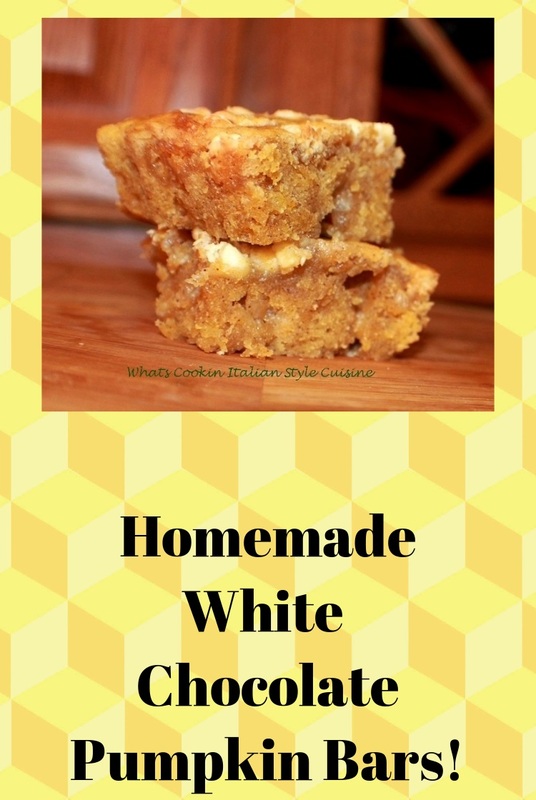 Do give these delicious homemade white chocolate pumpkin bars a try. Everyone will love them no matter what time of the year you make them! Add the dry ingredients blending well. Add 1 1/2 cups of chips to batter. comes clean from the center. You have me crave some sweet pumpkin treats! These look wonderful, Claudia! White chocolate and pumpkin sound like a delicious match! Looks great but I'd have to change the title. I would like to try butterscitch chips instead! A must make this fall! I could literally eat pumpkin all year round! So yummy!!! There is nothing like the combination of chocolate and pumpkin! This looks delicious - will definitely have to give the white chocolate a try asap! 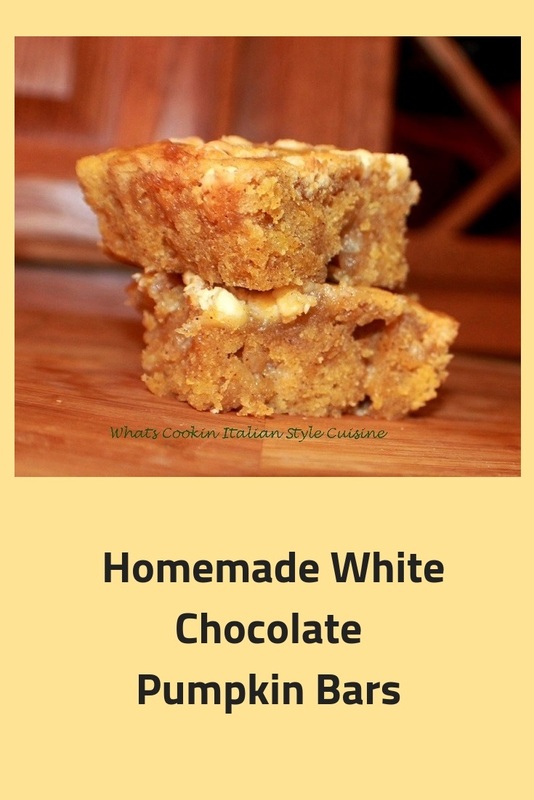 These looks wonderful and my kids just love pumpkin desserts and these are a bonus that they include white chocolate. YUM! This looks to die for! 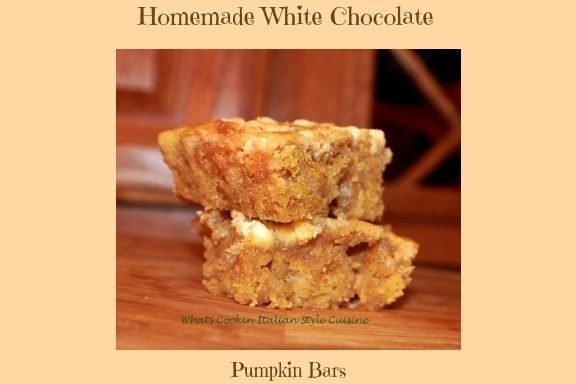 I have never thought of putting white chocolate with pumpkin bars! What a great combination of flavors! Perfect sweet treat for fall!